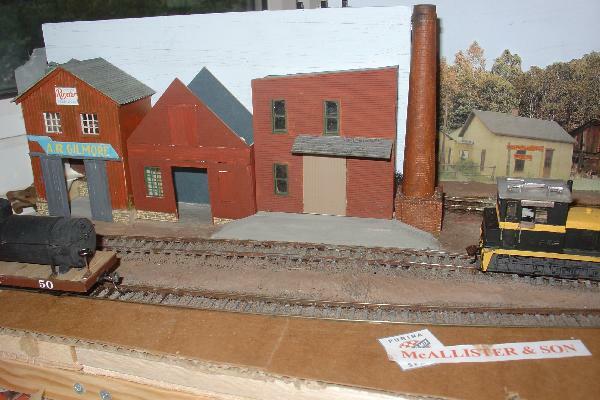 Made a start yesterday on the depot at Tallahatchie, adapted from parts of a kit of unknown origin. I've had to add a skirting board and some extra at the top of the walls to make the building large enough for 1/55th scale. 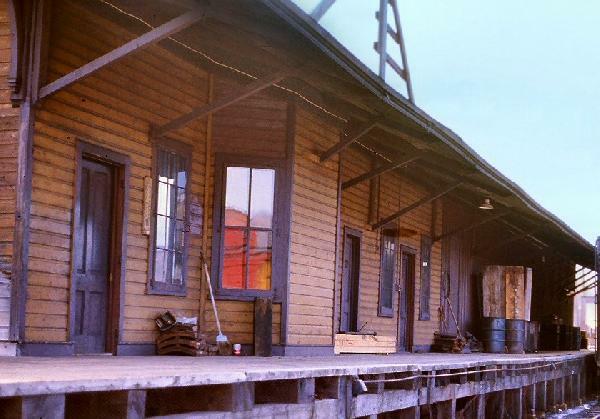 The card roof is to check the height of the eaves and whether the overhang clears passing rail vehicles; the final finish will either be tar-paper or shingles. I'll need to add some framing around the doors and windows as they are a little too small. 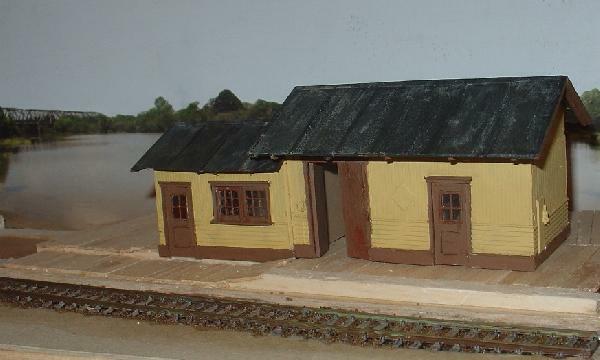 Edit: Managed to get a bit more modelling time in the late afternoon, increasing the height of the freight house doorways, and adding door and window frames to the front of the building. This has improved the look quite a bit and will give me a chance to pick the mouldings out in a darker colour; present thinking is buff walls and brown mouldings. It's been a while since I last worked on Tallahatchie, the holiday season and the temptation to get going on the home-based version of Puerto Paseo being two of the distractions. Another cause was wanting to get the painting of the depot's walls done before fitting the roof in place. Having no cream colours in stock, I found it impossible to get the colour I wanted from the available browns and yellows - the results were all too muddy-looking. A visit on Saturday to a craft/hobby shop turned up some large tubes of acrylic colours at much the same price as the tiny pots of colour supplied for modellers. Work should therefore be resuming later today. Meanwhile, here's what I hope the result will look something like. Still not sure of the colours, but the shapes are OK. All are HO kits, ex-Lazy River, boosted up with higher foundations and enlarged doorways. The Purina ad will cover the blocked-up window in the centre building, but I must print out the name panel again as I dropped it in the wet ground cover. The buildings have made some progress, but still need toning down a bit more, and we're still waiting for the signwriters for MacAllister's warehouse. 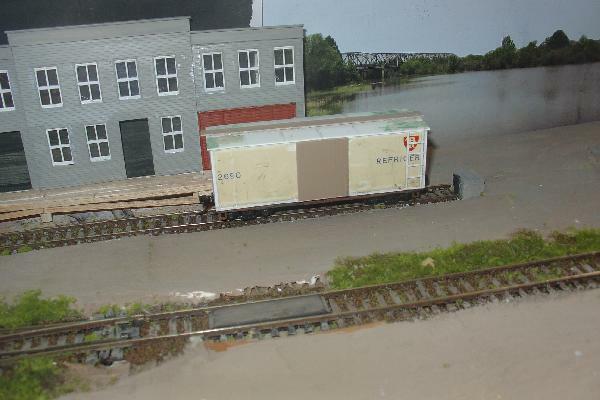 Having decided not to have a boat at the dock I'm going to extend the wooden surface almost up to the backscene, following the example of Gordon and Maggie Gravett's Arun Quay. This avoids the need to blend the photographic water with the horizontal painted portion. Good call extending the platform to just short of the backscene, easier to hide the join from view than blend 3D and 2D, especially with something as awkward to model as water. Nice touch with the open doors revealing interiors but perhaps a darker shade inside, away from the sunlight, would be better? It could also help with a TARDIS effect and make the insides look deeper than the outsides permit in the case of the low relief models. Good idea, Bob. Still a work in progress - putting the roof on seems to have bent the main structure, so that both ends are not fully in contact with the ground, so I shall be looking at the interior of this and the warehouses. 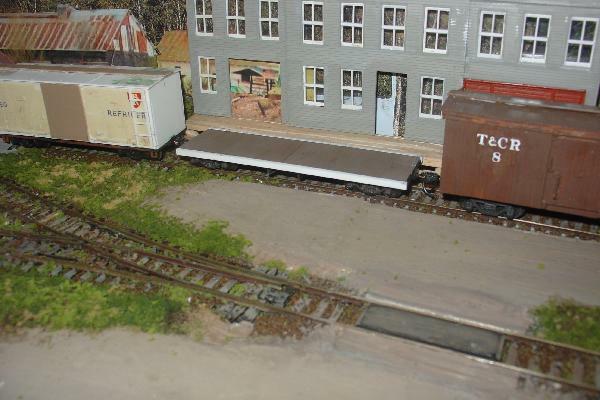 Also need to have some crates and barrels inside (something I've been collecting at shows for some time) and possibly one of the depot's staff checking consignments in the freight house. The grass is greener, now, in Tallahatchie - never mind what it's like outside! 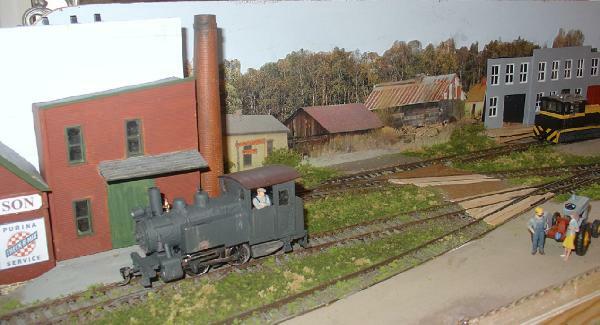 Just got the grade crossing to finish off and then tackle the Ruff-Edgess sawmill where the diesel switcher is lurking. I was thinking of not having end-scenes as I couldn't think how to blend the corner images. However the layout looked unfinished without them, so they were added this afternoon. A little cutting up of some of my stock of images produced these mock-ups, which look OK, although a little more trimming and tweaking is needed before the glue stick comes out. Taking pictures does emphasise the areas needing improvement, which are not always visible to a quick study of the scene - more paint needed inside Gilmore's and a general tone-down of the red frontages would be advantageous. Had a good day yesterday with the back-scene and buildings but today the sun was too low and was casting horrendous shadows, so no pictures yet. Meanwhile, it has occurred to me that the line has two reefers but no traffic for them. 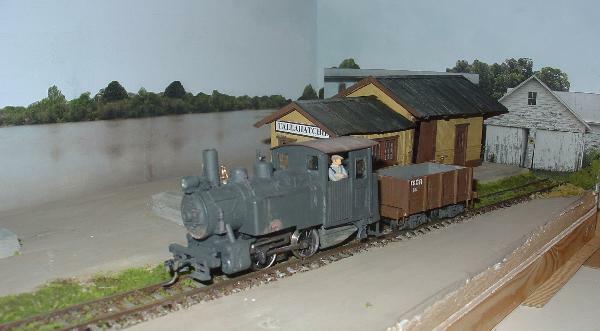 I am now converting the part-finished one into a second boxcar; its last picture showed the sides and a shortened flat car that provided the running gear. Since then it was erected and given roof hatches, which came off again today! It must be built of plywood as there's no planking detail. Hope to get it finished at the week-end. Mid afternoon with the rain starting to fall - good weather for photography! Starting with a view of Tallahtchie's industrial district. #1's raising steam ready to run down to the junction to run round the gondola and fetch another freight car. And here she comes with two cars to set out on the team track. 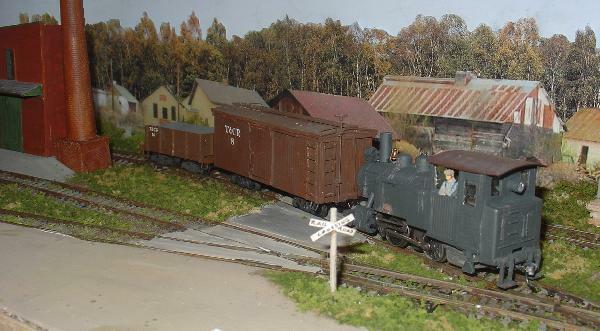 Having made a start on the second boxcar I suddenly realised that one of the unused HO flat cars in stock could be modified to 1/55 with very little work. I've cut the dropped centre panel off the side frames and widened the deck with a styrene strip on each side while today has seen a deck of coffee stirrers added. 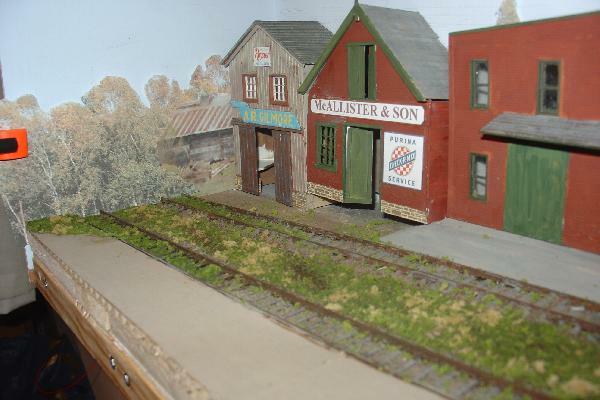 Then it was back to the boxcar to add the end ladders while the flat car's deck dried. Now I must find where I hid the press-studs I was using for brake wheels. If I can get a bit further today I'll try and post pictures tomorrow. My afternoon of modelling turned into less than an hour so the flat car didn't get finished (or photographed). Here is how it looked a couple of days ago - now it has a planked deck with brake wheel, and stakes along each side. I could have left the extra side pieces off and just fixed the stakes to the original sides, as it's now the widest vehicle, though not unduly so. Still I'd better do a clearance test before going further. Tomorrow looks good for adding the stake pockets and corner stirrups. Had a look on fleabay on Friday evening for any suitable 1/55 scale cars or trucks and found this one, that arrived today. The eyes will have to be painted over (the other windows are black gloss) and there is a smily mouth that will need a dab of filler, but otherwise its a nice Ford pick-up from the 1940s. Matching the paint colour will be fun! I may check to see if there are any alternative suggestions of period paint finishes online. I've mocked up a cameo scene with the driver picking up a couple of crates of fruit and the station agent handing over the shipping docket. Having set up that little cameo has made me think about Tallahatchie's population. Luckily I've remembered where I stored my unpainted figures, so got them out and ran a scale rule over them. 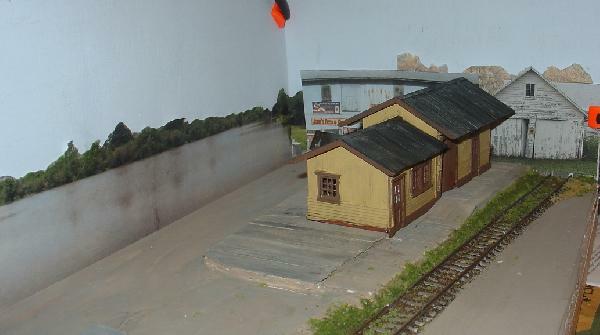 A few lend themselves to 1:55 conversions, while many of the others can be adapted for life on Isla Blanca. Apart from the group by the pick-up truck, there will probably be a seated and standing figure in conversation by the sawmill and a couple of people over by McAllisters. Another figure might be doing something to the tractor in the team track area (left foreground). That should be enough, I think. 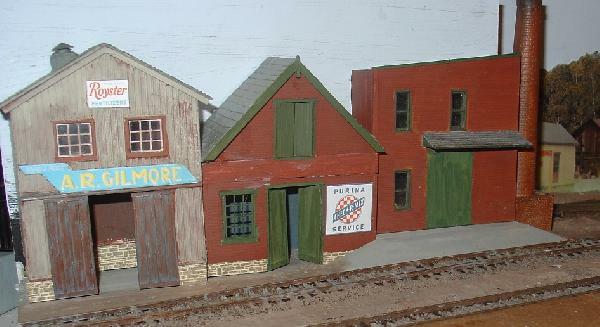 The railroad agent needs finishing and there are the three workers (plus another's who's temporarily gone AWOL) complete, so there's still a need for a seated figure, a more country-looking young woman for the pick-up's driver, and another warehouse worker to convert. In which case you'll be wanting one of these.